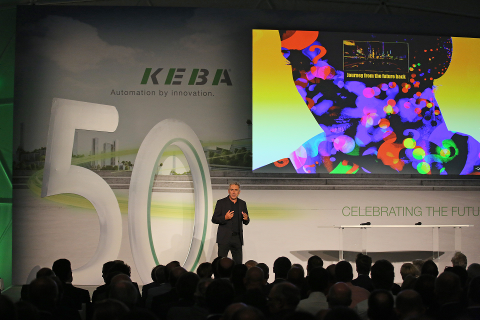 Customers, partners, suppliers and decisionmakers from the world of politics and economics, along with pupils and students from Upper Austria and the KEBAns (KEBA employees) themselves, celebrated KEBA’s 50th birthday. 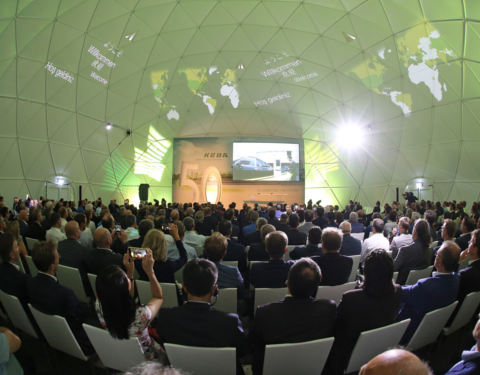 Our guests were impressed by the KEBA Future Dome, the select, high-tech solutions in the own-installed Innovation Lounge, and by Peter Fisk’s *“Journey from the future back” * keynote talk. We thank everyone warmly for coming and for the appreciation that came back our way. That was our Anniversary Night! 400 guests celebrated our 50th birthday together with us. Customers, suppliers, partners, and decision-makers from politics and business enjoyed an evening, which was informative and light-footed at the same time, and supported by a great atmosphere. One of the highlights was the keynote speech by Peter Fisk, who fascinated everyone with his sparkling fireworks display on future aspects. The entire keynote can be viewed on the KEBA YouTube channel. The direct video link can also be found further down on this page. 260 pupils and students from Upper Austrian educational institutions immersed themselves in the KEBA world on Experience Day. Under the motto "Automation that inspires", we opened our doors and hosted on the occasion of our 50th birthday students from higher technical colleges as well as from selected universities of Applied Sciences and the Johannes Kepler University of Linz. Whether it was to look inside an ATM or to understand the world of electric mobility and parcel lockers or to cooperate with a robot – the level of interest was high and fun was not in short supply. Numerous KEBAns (KEBA employees) celebrated the company’s anniversary together with their families on Family Future Day. The atmosphere was excellent, as both young and old took the opportunity to experience KEBA solutions from the sectors of industry, banking, logistics and electric mobility sectors at first hand and were visibly impressed. Additionally, 33 youths also explored KEBA in their role as "dashing reporters". They interviewed visitors and experts in the Innovation Lounges, photographed, texted, and produced their own newspaper. And even the smallest of the visitors enjoyed a colourful program of events. Peter Fisk – one of the highlights of our Anniversary Night on the occasion of our 50th birthday – fascinated our 400 guests from all over the world with his sparkling fireworks of future aspects. The entire *"Journey from the future back" * keynote speek can be found here! If you would like any information or have any question, our contact persons are available for you.